Bridget, accompanied by her sister Margaret, sailed aboard the "Agra" bound for Rockhampton, Queensland, Australia. The Immigrant Ship Agra departed London, England, 17 March 1874 bound for Rockhampton, Queensland, Australia. This notice was published in the London Daily News Newspaper, 18 March 1874, page 7, under shipping Intelligence. Bridget and Margaret Wall arrived at Rockhampton, Queensland, Australia aboard the ship "Agra". They were assisted immigrants, which means, they were required to work where directed, in the state of Queensland. I would assume, they would have worked their two years in the Rockhampton Area as domestic servants. The date on the passenger list is incorrect. 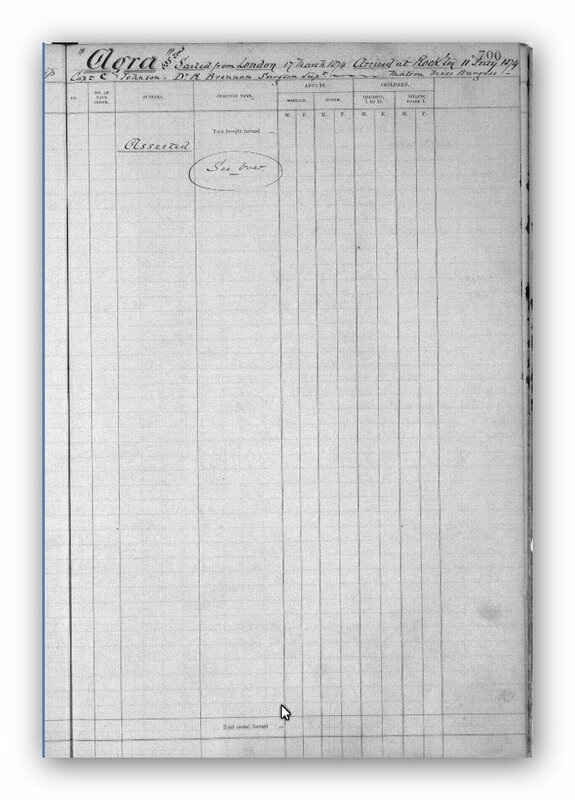 The document records the arrival date at Rockhampton as the 11 June 1874. The vessel actually arrived 11 July 1874. The attached newspaper articles record the correct date. I spoke with Queensland State Archives about this and they were aware of the error. I was advised that the state archives were inundated with water during the floods in the 1890s and a lot of records were water damaged and these records were recopied and numerous errors exist in them. the Archivist told me they are unable to alter the dates on the records as they are historical documents. The immigrant ship Agra Arrived Keppel Bay (Rockhampton), Queensland, Australia 11 Jul 1874. This shipping notice was published in the Rockhampton Bulletin, Newspaper, Queensland, Australia, Monday 13 July 1874, Page 2. Rockhampton, Queensland, Australia 11 July 1874. They appear on page 706, passengers 223 and 224 respectively. Arrival Immigrant Ship Agra at Keppel Bay (Rockhampton), Queensland, Australia. The immigrant ship Agra arrived at Keppel Bay, Queensland, Australia 11 July 1874. This shipping notice was published in the Rockhampton Bulletin, Wednesday 15 July 1874 on page 2 under Shipping Intelligence. The Immigrant Ship Agra from London arrived at Keppel Bay, Saturday 11 July 1874. This shipping notice was published in The Brisbane Courier Newspaper, Tuesday 14 July 1874, Page 2. This article on the Immigrant Ship Agra was published in the Rockhampton Bulletin Newspaper Wednesday 15 July 1874, page 2. This article on the hiring of the Immigrants of the immigrant ship Agra was published in the Rockhampton Bulletin Newspaper, Wednesday 15 July 1874, page 2. 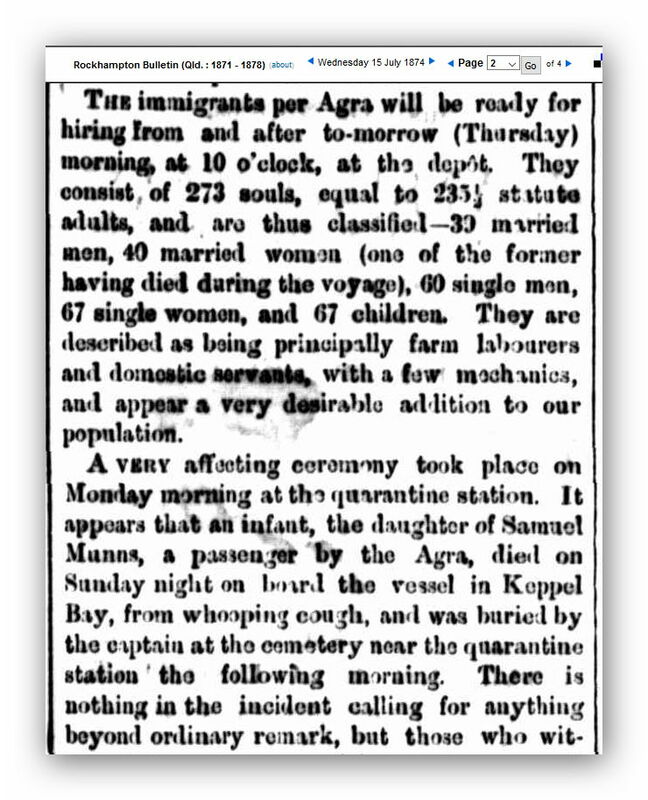 This article on the immigrants of the immigration ship Agra, published in the Rockhampton Bulletin Newspaper, Saturday 18 July 1874, page 3. Bridget Kennedy's funeral left her late residence, 15 Reserve Street, Alexandria, New South Wales, at 1:45pm, Monday 17 Jul 1933 for the Catholic Cemetery, Rookwood, Section C, No.2 Platform. [S4] NSW BDM, New South Wales Government, Reg No. 668/1900 (Reliability: 3), 18 Feb 1900. See attached birth certificate of her son, John Daniel Kennedy born 18 February 1900, Birth Registration No. 668/1900. [S381] Queensland State Archives, 706 (Reliability: 3), 11 Jun 1874. [S383] London Daily News, 7 (Reliability: 3), 18 Mar 1874. See attached Departure Notice for the immigrant ship Agra. This notice was published in The London Daily News Newspaper, 18 Mar 1874, page 7. [S135] The Brisbane Courier Newspaper, 2 (Reliability: 3), 14 Jul 1874. See attached shipping notice, arrival of Agra, published in the Brisbane Courier Newspaper, Tuesday 14 July 1874, page 2. [S382] Rockhampton Bulletin Newspaper, 2 (Reliability: 3), 13 Jul 1874. See attached shipping notice reporting the arrival of the Agra. this notice was published in the Rockhampton Bulletin Newspaper, Monday 13 July 1874, page 2. [S382] Rockhampton Bulletin Newspaper, 2 (Reliability: 3), 15 Jul 1874. See attached shipping Intelligence reporting the arrival of the Agra. Published in the Rockhampton Bulletin Newspaper, Wednesday 15 JULY 1874, Page 2. [S382] Rockhampton Bulletin Newspaper, 3 (Reliability: 3), 18 Jul 1874. See attached newspaper article published in the Rockhampton Bulletine, Queensland, Australia, Saturday 18 July 1874, page 3. [S382] Rockhampton Bulletin Newspaper, 2 (Reliability: 3), 18 Jul 1874. See article The Immigrants per Barque Agra From London - the hiring began. Published in the Rockhampton Bulletin, Saturday 18 July 1874, page 2. See attached article on the immigrants of the Agra published in the Rockhampton Bulletin Newspaper, Queensland, Australia Wednesday 15 July 1874, page 2. [S94] The Sydney Morning Herald, 7 (Reliability: 3), 17 Jul 1933. See attached Newspaper Clipping. Funeral notice was published in The Sydney Morning Herald Newspaper, Monday 17 July 1933, Page 7. [S155] Catholic Cemeteries & Crematoria (Reliability: 3), 17 Jul 1933.